An 80-year-old woman has died after being hit by a tear gas canister at her window during Saturday’s fuel protests in the French city of Marseille. The woman, who lived in an apartment near to where the protests were taking place, was hit in the face while closing the shutters. Protests over fuel tax have grown into general anger at higher living costs. The woman was taken to hospital, but died during an operation after suffering shock, local media report. Three other people have been killed in the protests since demonstrations started more than two weeks ago, police said on Sunday. France’s interior ministry says about 136,000 people took part in the protests nationwide on Sunday, showing widespread support for the movement known as the “gilets jaunes” (yellow vests), who complain about a sharp increase in fuel taxes. They are so called because they have taken to the streets wearing the high-visibility yellow clothing that is required to be carried in every vehicle by French law. Will Macron face down French fuel protesters? Anne Hidalgo, the mayor of Paris, told French media she estimates that Saturday’s protests have caused between €3-4m (£2.7- £3.6m; $3.4-$4.5m) worth of damage. The group has cancelled a planned meeting with Prime Minister Edouard Philippe scheduled for Tuesday. The BBC’s Hugh Schofield in Paris says more moderate members of the movement who said they would be prepared to talk are being shouted down by more extreme elements, and have been receiving death threats. A spokesperson for the “yellow vest” movement, Christophe Chalençon, called for the government to resign on Monday, to be replaced by what he termed “a true commander, like Gen de Villiers”. Gen Pierre de Villiers is a former head of the French armed forces who quit after a clash with President Emmanuel Macron over budget cuts. The French president held an urgent security meeting earlier on Monday. Ministers said that while no options had been ruled out, imposing a state of emergency had not been discussed during the talks. Prime Minister Edouard Philippe also spoke with leaders of the opposition on Monday. Far-right leader Marine Le Pen, who was at the meeting, warned that Mr Macron could become the first president to give the order to open fire on his own people in 50 years. She said he should scrap increases in fuel duty, lower gas and electricity prices and end a freeze on the minimum wage and minimum pension. “The impact is severe and ongoing,” Mr Le Maire told the AFP news agency. Some retailers had seen sales drop by around 20-40% during the demonstrations, while some restaurants had lost 20-50% of their takings, he added. Protests have continued into Monday. About 50 “yellow vests” blocked access to a major fuel depot in the port of Fos-sur-Mer, near Marseille, and petrol stations across the country have run out of fuel. Restrictions have been put in place in Brittany on the amount of petrol motorists are allowed to buy. Also on Monday, French private ambulance drivers staged further demonstrations against a range of social security and healthcare reforms they say could affect their services. Dozens of trucks formed a blockade from Paris’s Place de la Concorde to the French National Assembly. There is shock and anger in the mainstream French press after “yellow vest” protesters ran riot in Paris neighbourhoods, burning cars and looting shops. 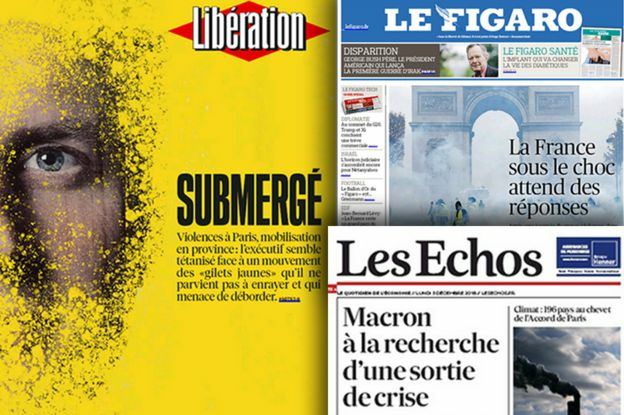 Left-wing daily Libération says: “Paris has undoubtedly experienced the most violent rallies since the events of May ’68.” The paper notes the “heterogeneity” of the protesters – from nationalists and far-right student groups to hard-left militants and anarchists. In an editorial entitled “National emergency”, centre-right daily Le Figaro says that 1 December will “remain a collective injury for the nation”. It comments that “in the face of this explosion of inexcusable violence”, the whole country “had the feeling of witnessing the collapse of the state”. Business daily Les Echos says in its headline that President Emmanuel Macron “is facing chaos”. 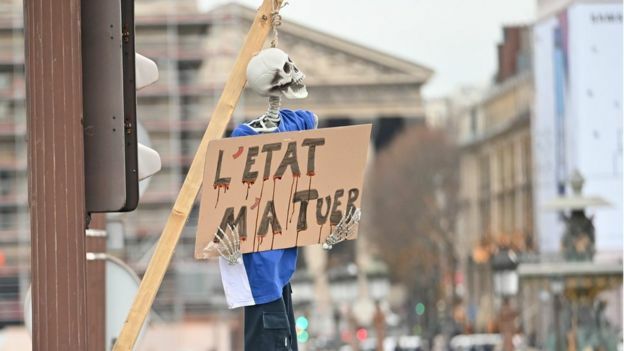 “After the violent scenes on Saturday, the Elysée is still looking for a strong political response,” the paper notes. Centre-left daily Le Monde speaks of a “major political crisis” and notes that after returning from Argentina, President Macron immediately went to the Arc de Triomphe in central Paris which was a “scene of violence”.